Draken International, the leading global provider of contract air services, recently supported operational testing of the F-35 at Edwards Air Force Base by flying the company's A-4K fighter jets as simulated adversaries. 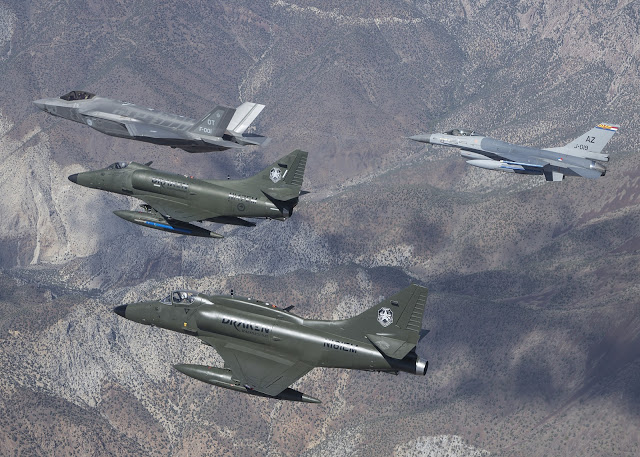 The large force training exercise was initiated by the 323rd Test and Evaluation Squadron and supported by the Joint Strike Fighter Operational Test Team from Aug. 17-28. This was the first time any commercial air services company had provided adversary support for the F-35. Draken flew as many as five of their A-4K aircraft at a time as adversaries in support of F-35 operational testing against both Royal Netherlands Air Force and Royal Air Force F-35A and F-35B aircraft as well as Royal Netherlands F-16 Vipers.